with an aftershoot scheduled with us, we were crossing our fingers hoping that jen & ryan would consider wearing bridal attire. 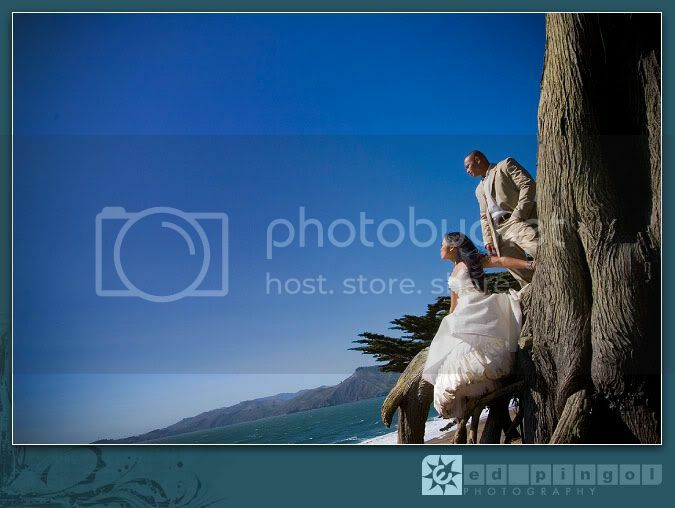 so we were thrilled to find out that not only were they willing to do this but were willing to get near the water, climb onto a tree, hang over the edge of a platform, and essentially, "trash the dress!" "what is that?" you might be asking. it's a relatively new trend in which recent brides (and grooms) are willing to don their wedding attire for a special photo session in locations/poses in which they don't worry about keeping the dress in pristine condition. some will walk through city streets for urban shots, along the water's edge or submerge themselves in lakes/beaches/swamps/fountains, and some have even set the dress on fire! it's freakin' crazy! now you may be asking, "WHY would anyone do that!?" it can be a metaphor that the couple has so much faith in their marriage that a wedding dress will never be needed again. or that because they spent so much money on the dress and it will almost 100% guaranteed never be worn again, not even by the daughter they are "saving" it for, why not put it on one last time and get some awesome photos. the term "trash the dress" has actually become a misnomer since many brides have been able to get the dress drycleaned and preserved in it's original condition. for more, check out trashthedress.com. now back to jen & ryan... such a great couple to work with. they were willing to brave heights, tides, wind, sand, and dirt in their snazzy outfits and got some awesome images. congrats again, newlyweds! newly wed & just as gorgeous and in-love as the day they said "i do"